The second largest emirate of United Arab Emirates, Dubai is a beautiful tourist destination located in the Persian Gulf on the Southeast Coast. Emerging as a business hub and a global city, it has become a major attraction for travelers worldwide. The souks of Dubai are open air markets that are equivalent to the term “bazaar”. These famous souks are a must visit for their vibrant and attractive atmosphere without which your trip to Dubai would be incomplete. Take a look at the various must visit souks when you travel to Dubai. 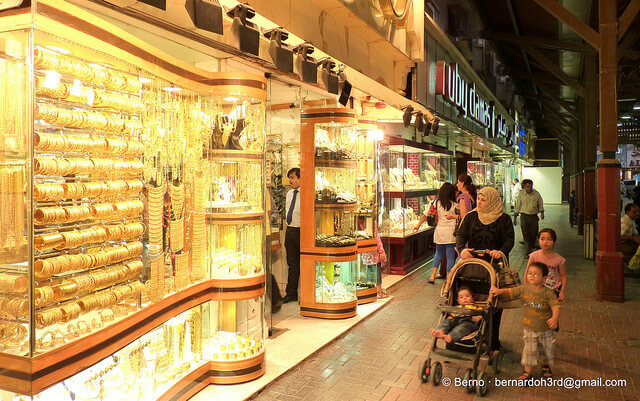 The most famous and well known souk of Dubai is the Gold Souk that features walkways that are lined with a variety of jewelry shops that sell precious pieces that are made of silver, gold and other precious stones. Situated just a hundred yards from the Al Ras Metro Station in Deira, it is a must visit Souks of Dubai. A modern recreation that aims to impress the modern tourists, this is part of the Madinat Jumeirah complex that hosts a large number of restaurants selling a variety of delicacies, a theatre and a nightclub. Souks of Dubai are a must visit for their vibrant and attractive atmosphere without which your trip to Dubai would be incomplete.